In 1971, a small group of activists set sail from Vancouver in an old fishing boat. Their mission: to stop President Nixon’s atomic bomb tests on Amchitka, off Alaska. They succeeded – and from these humble but brave beginnings, Greenpeace was born. Now I’m excited to tell you about the launch of an award-winning feature length documentary about Greenpeace’s formation, focusing in particular on one of our founders – Bob Hunter. In ‘How to Change the World’, director Jerry Rothwell uses dramatic archive footage that has not been shown for over 40 years, and transforms it into a gripping, vivid and often-thrilling film. The film features incredible scenes of the first peaceful direct actions our founders took to prevent nuclear testing and whaling. It is here that the Greenpeace philosophy of bearing witness, and using peaceful direct action to generate media attention was born. These are still the core values behind all our campaigning today. On Wednesday 9th September there will be a live premiere of the film with panel discussion and Q&A broadcast via satellite to over 140 cinemas across the country. As one of our supporters this will be an amazing opportunity to come along and enjoy this unmissable event at your local cinema. The film will then be on general release nationwide from 11th September. 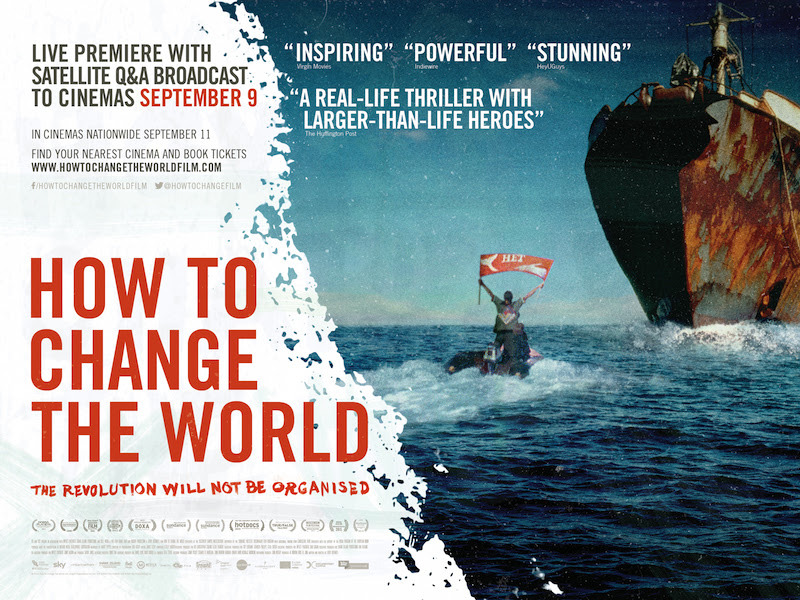 Having already won the Environmental Award at the Sheffield Documentary Festival and won praise at the Sundance Film Festival, ‚How to Change the World‘ is one of the must-see documentaries of 2015. We don’t accept any money from companies or governments so we can be independent and challenge anyone who threatens the planet or peace. To help us keep fighting climate change, defending our oceans and protecting ancient forests, you canmake a regular donation by direct debit. Thank you! If you no longer want to be in the loop with the latest news from these emails, we’ll be really sad, but you can unsubscribe here.